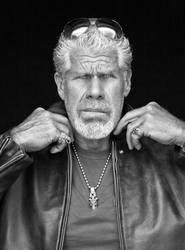 No matter what television generation you're from, you know exactly who Ron Perlman is. Clay Morrow from Sons of Anarchy. His Emmy-nominated and Golden Globe-winning work as Vincent in Beauty and the Beast. And he's Hellboy. You know, the injury proof, super-strong refugee from hell who appeared in 2004's Hellboy, and its 2008 sequel, Hellboy II: The Golden Army. In fact, Perlman is one of Hellboy director Guillermo del Toro's actors of choice, popping up in the some of his other films like Cronos, Blade II and more recently, Pacific Rim. Perlman also has a large following from his voice-over work ranging from narrating the post-apocalyptic game series Fallout, to Clayface in Batman: The Animated Series, Killer Croc in The Batman, Slade in Teen Titans, The Lich in Adventure Time, The Stabbington Brothers in Disney's Tangled, and as a different kind of narrator in the television series 1000 Ways to Die.